The Knee Joint comprises of articulation of the long bone of the thigh (Femur) and the shin bone (Tibia). Between the bone ends are 2 round discs made of cartilage called the medial (inner) and lateral (outer) Meniscus. Each meniscus acts as a shock absorber cushioning the impact of the Femur on the Tibia during weight-bearing activity. Normally the surface of the meniscus is very smooth allowing easy movement of the femur on the tibia. The Meniscus is important for transmitting load across the knee. The Menisci increase the surface area of contact and fill the gaps between differently shaped articulating surfaces. Meniscus Tears are divided into Traumatic Tears and Degenerative Tears. This type of Tear occurs in sports that require sudden changes of direction and twisting movements eg. football, soccer, basketball, netball and snow skiing. Meniscal Tears take place when the foot is planted or fixed on the ground and a twisting force is applied to the Knee (e.g. when another player's body falls across the leg, or when a player is tackled) or following a forceful jump or landing. This type of Tear may occur over time through gradual wear and tear. These Tears may be associated with degenerative changes in the Knee Joint. In older patients where degenerative changes are present, injury to the Medial Meniscus may occur with a relatively trivial trauma or movement. The type of Meniscus Tear depends on the force and Knee movement at the time of injury. Most commonly, younger athletes will tear the meniscus lengthwise if the Femur and the Tibia trap the Meniscus when the Knee rotates. This type of Tear is referred to as a Bucket Handle Tear. Other types of tears include flap tears which are caused due to repetitive stress such as running. Older patients with degenerative changes tend to have transverse or horizontal type of tears. Since the outer portion is the only part that receives any blood supply, it is likely that tears on the inside will not heal, therefore surgery is necessary. Symptoms of a torn meniscus include recurrent swelling (effusions), mechanical symptoms (popping, catching, and locking), and pain with deep squatting. The pain is typically localized to one side of the Knee or the other. A Medial Meniscus Tear hurts on the inside of the Knee, while a Lateral Meniscal Tear hurts on the outside. Cutting, pivoting, and athletic activities may be difficult to perform by a person with Meniscus Tear. Sudden inability to straighten the knee is termed as locking. This happens when a small flap from a Meniscal Tear gets caught in the Knee Joint as you bend it. A small piece of the Meniscus could actually be floating around inside the joint. This fragment, called a loose body, can get lodged between the moving parts of the Knee, causing the Knee to lock. In these cases, surgery may be needed, sometimes right away, to fix the flap or to remove the loose Body. After the special clinical tests are performed, the surgeon may advice for an MRI of the Knee or a diagnostic arthroscopy to confirm the diagnosis. The advantage of a diagnostic arthroscopy over an MRI is that if the pathology is confirmed on arthroscopy the surgeon can go ahead and perform the surgery in the same sitting. Immediate treatment of Meniscus Tear begins by giving rest to the Knee, cold or ice application locally, compression by a crepe bandage and elevation of the limb on a pillow. Nonsteroidal Anti-Inflammatory medications (ibuprofen etc.) should be started as well. If this protocol is administered for the first 48 hours after injury, there will be a considerable decrease in pain and swelling of the Knee. The Menisci have a very poor blood supply and hence cannot be healed on their own. The torn Menisci can cause symptoms of locking, clicking and / or pain. Presence of any of these symptoms warrants a Arthroscopic Knee Surgery. At the time of removal of the damaged part, only the smallest amount of the Meniscus is taken out. Meniscal Surgery is a keyhole surgery performed under the guidance of knee arthroscopy. Surgery is done either under general or under spinal anesthesia. The Arthroscopic Surgeon in Mumbai begins the operation by making two small keyhole openings into the Knee, called portals. These portals are where the arthroscope and surgical instruments are placed inside the Knee. Care is taken to protect the nearby nerves and blood vessels. 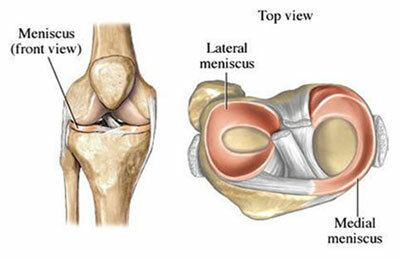 The procedure to carefully remove a damaged portion of the Meniscus is called Partial Meniscectomy. The surgeon starts by inserting the arthroscope into one of the portals. A probe is placed into the other portal. The surgeon watches on a screen while probing the Meniscus. All parts of the inside of the Knee Joint get examined. Surgical instruments are placed into another portal and are used to remove the torn portion of Meniscus. When the problem part of the meniscus has been removed, the surgeon checks the Knee again with the probe to be sure that no other tears are present. A small motorized cutter is being used to trim and shape the cut edge of the Meniscus. The joint is flushed with sterile saline to wash away debris from the injury or from the surgery. The portals are closed with staples. Meniscal Surgery is a day care surgery and thus there is no need for admission to the hospital. The portals are covered with surgical stripes or closed with staples and the knee may be wrapped in an elastic bandage. After Menisectomy weight-bearing is commenced immediately. Patients having undergone a partial menisectomy do not need any formal physiotherapy, however they continue to strengthen their quadriceps in a home program. There may be some discomfort for about 15 days as instruments are passed through tiny keyholes but this does not prevent you from doing daily activities. Alternate ice and heat therapy should be continued for 15 days.